Tokyo is an amazing city. It has so many contents and something for everybody. It is the gastronomic capital of the world where you can find any kind of cuisine that you desire. Still, having a lot of choices can make your decision about where to dine a bit more difficult. That’s why this list of the best restaurants in Tokyo can help you find the perfect place for you. When you are relocating to Japan, you have a lot of research to do. One of the things that you need to explore is, of course, the national cuisine of the country that you are moving to. Since the Japanese cuisine is very famous worldwide, you’ve probably had encounter it before. If you haven’t, that isn’t a problem – some of the best restaurants in Tokyo will show you all of its charms. When you are moving to Tokyo, you have to keep an open mind. If the Japanese cuisine wasn’t attractive to you, you may change your mind once you taste it. But you have to take that step. In order to have the best experience, you need to learn the basics of Japanese cuisine. There are many similar dishes that foreigners think that are the same thing and they are actually very different. Sushi is the most famous Japanese dish. It comes in different shapes and forms, and every one of them has its unique name and something that separates it from other groups. 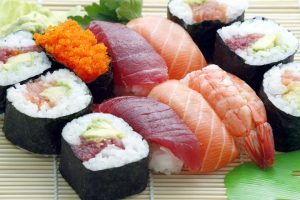 Sushi is made from the two essential ingredients: Shari – boiled rice with rice vinegar and Neta – additions to rice such as raw fish or seafood. While the additions in sushi vary from type to type, shari is the thing that makes sushi unique. 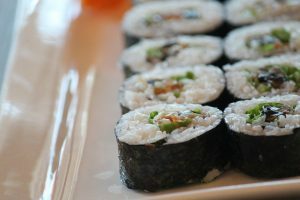 If it’s made with another type of rice, that the dish cannot be called sushi. The best domestic moving advice that you will get is to get to know this dish since it’s everywhere. Sushi is one of the most famous dishes in Japanese cuisine. Nigiri – to make this kind of sushi, shari is pressed by hand into a square shape. The various additions (shrimp, a piece of the fresh fish, vegetable etc) are then place on that form. You should eat this kind of sushi by hand. Maki rolls – is the most famous sushi shape. Shari is rolled into the cylindrical with the additional ingredients in the middle. That shape is then wrapped in seaweed, thin slices of the cucumber or soy paper. Chirashi or chirashizushi – this is the most strange form of sushi because it doesn’t resemble the other types of this dish. It’s served in a bowl where shari and a lot of additions are mixed together. Californian rolls – are the Western version of the sushi. It has the same shape as the maki roll. The main difference is that the filling is usually vegetables, fake crab meat, tofu or cheese. While some of the best restaurants in Tokyo do serve this kind of sushi, it’s not traditional Japanese sushi. Maki rolls are the most common kind of sushi. As said, the main ingredient that makes sushi is shari rice. Sashimi is a totally different dish than the sushi. Sashimi is only the plate of the raw fish. Without the shari or any other kind of rice. Since there are many Japanese restaurants in the world, not every owner is familiar with the fact that these are the two different dishes. That’s why they place sashimi in the sushi part of the menu, which is creating the confusion. Sashimi isn’t the same dish as sushi. Since its opening in 2003., this restaurant has become one of the best restaurants in Tokyo. It has exceeded all expectations and its quality was rewarded with three Michelin stars. 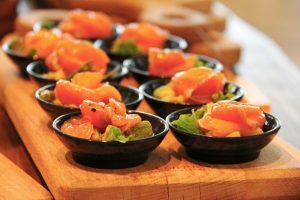 Its fresh seasonal menu, 60 different wines, Shizuoka-brewed sake, excellent shōchū, tasty sushi, and impeccable service are the reasons why this restaurant has become so popular in a very short time. Here you can savor the authentic Japanese flavors and enjoy the charming ambiance of the restaurant. Since it’s very popular, you should book your place in advance. This restaurant is a place where world-famous chef Joël Robuchon creates its magic on the plate. He portrays all of his love for food, cooking and eating into his restaurant. This chef has several restaurants all around the world. He makes every one of his many international restaurants personal and individual, which makes this franchize unique. Joël Robuchon Restaurant has three Michelin stars and without the doubt is one of the best restaurants in Tokyo. Seiji Yamamoto is head chef of this restaurant, and he combines the Japanese cuisine with contemporary trends. This chef is creating the real masterpieces on the plate that are a delight for all senses. That is actually his goal – to make creative dishes that stimulate each sense. In order to do that, he insists that customers don’t wear strong perfumes as it may interfere with the overall dining experience. It may seem like a strange request, but it is so rewarding since you will experience food as you have never experienced it before. Yamamoto is a world-famous chef, and his passion for Japanese cuisine is contagious. At the restaurant Nihonryori RyuGin, you can see and taste what a progressive approach to Japanese food means, while you enjoy an authentic dining experience.